Happy New Year from all of us at Fotobella! Did you know that copper is the hot new metal for 2017? It's been a fave of mine for awhile, so I used it on this tag, along with some of the hot new colors, like orange and blue/green. Besides being my first project of the year, this is also my first project using Ranger Dyan Reaveley's Dylusions Paints, which are so vibrant and easy to use. I used a baby wipe to apply Pure Sunshine, Vibrant Turquoise, and Melted Chocolate onto a Ranger Manila Tag. Then I added some drips with Wild Honey Distress Spray Stain, and stamped the background with the Prima Salvage District #2 Stamp in black. 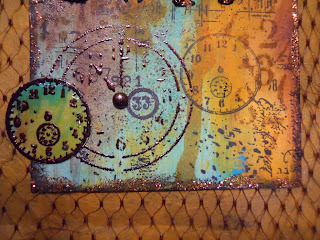 The numbers were masked with Vintage Photo Distress Spray Stain using Prima's Salvage District Clock Stencil, which I also used to emboss the larger clocks. 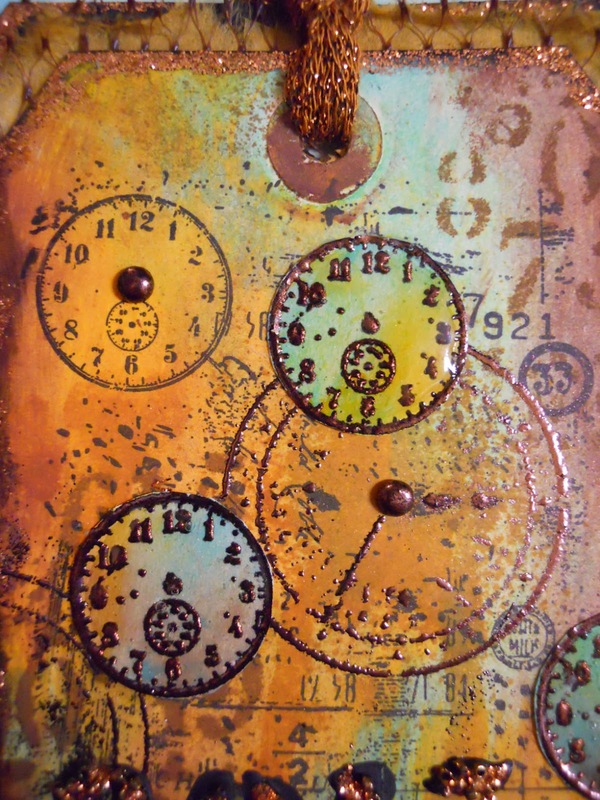 Then I embossed the smaller clocks onto cream cardstock, colored again with the same Dylusions Paints, fussy-cut them, and coated them with Glossy Accents. 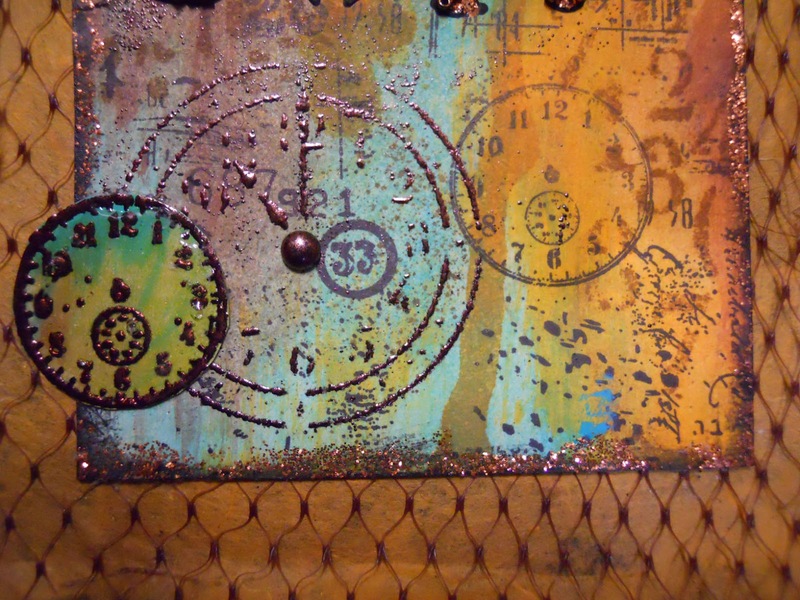 To some of the clocks I added small black brads that I embossed with copper. 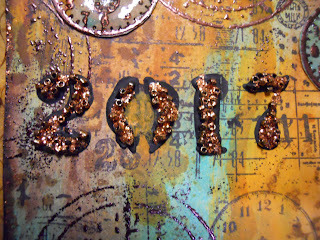 The date was done with Ranger's Cargo Alphabet Stencil using Prima's Black Gesso. 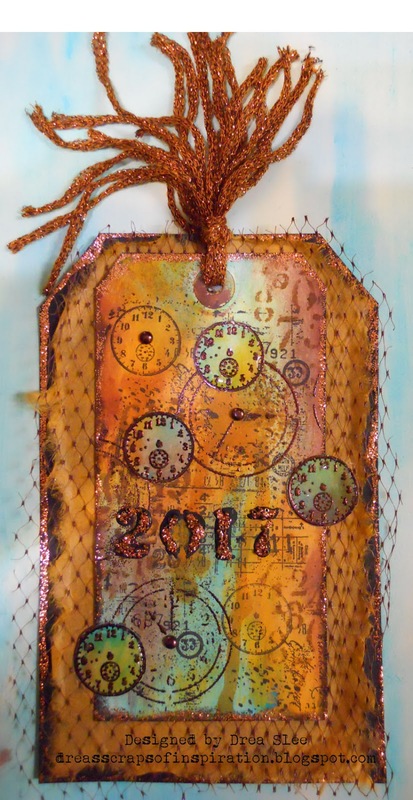 I added small beads to the gesso while it was wet, and once dry, covered it with Copper Stickles, which I also used to outline my tag. Then I backed it with some recycled netting and torn mulberry paper mounted on black cardstock, and tied off with some copper fibers. Thanks for your visit, and shop FotoBella for these supplies and more! It really does look like copper! Great job! Thanks ReNae! It was fun to work on! Happy New Year to you too!